Time for another everyday pen review! I promise that there will be some long over due fountain pen reviews coming soon. As it is a everyday pen, it is made from a everyday material... deep breath....... plastic! This plastic is covered with a matt black finish which actually looks nice. The main section of the pen is a solid matt black finish with a see through black tinted plastic used for the grip area and the end of the barrel. There is a wave style pattern used to provide extra grip while writing and for me this works really well. To finish off the design of the Tradio the plastic that covers the nib section is a shiny black. For me this shiny plastic doesn’t fit the overall look of the Tradio, it stands out badly for me. The cap of the pen uses the same matt black finish as the barrel section. The clip of the barrel is plastic and has very little spring strength at all. I wouldn’t be confident of the Tradio staying securely in a pocket. Just below the tip of the cap there is a clear plastic window that lets you see the nib of the pen when capped. It securely clicks into place when capped or posted. This is a very light weight pen that is a very comfortable pen to hold for long periods of time. With the cap posted it does make the pen feel pretty top heavy though. I think for the best writing experience it is better to set the cap to one side. With the cap it comes in at 13.9cm in length. Without the cap it is 14.6cm in length. With the cap posted it is 13.1cm in length. The Tradio uses a refill called Pentel LR7 which you can get in the following colours: Black, Blue, Red and Violet. The cost of the refill comes in at £1.12. 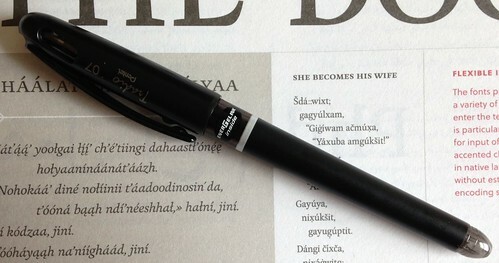 To replace the refill it is very easy, the shiny black plastic that covers the nib section can be unscrewed. This uses the same 0.7mm refill as the Pentel EnerGel X Gel Rollerball that I have previously reviewed. You can read that review to get a detailed insight into the ink that is used. The Tradio costs £1.99 and for me it is a pretty good pen. I think as a everyday pen it might be worth buying a Pentel EnerGel X Gel Rollerball instead as it is a clicker. I have given two Pentel EnerGel X Gel Rollerball’s as gifts to two lifted handed people and they have enjoyed using them as the ink drys very quickly.